I have never wanted to recommend so wholeheartedly a book that I’ve felt was so preposterous. And I mean that most un-ironically. Is there a book anywhere so deeply weird and fascinating as this one? In short, The Origin of Consciousness suggests that until well after the invention of writing mankind was not conscious. This is crazy. A totally crazy idea. Instead of what we think of as conscious thought—that is, the you inside of you that’s aware of itself and aware of you thinking—man’s mind was bicameral, or made up of two distinct separate parts. Two non-conscious selves, one that accepted orders and one that gave orders. Oh, and the order-giver spoke in the voice of god. Or rather, a cacophony of gods. And that’s just the beginning. It gets crazier from there. I wish I could graph just how crazy it gets as the whole history of western civilization is completely reinterpreted based on this insane idea but when the vertical gets too high graphs stop making sense. I’m not sure I’ve ever read anything so good. Like me, you’ll probably think it’s totally crazy—and fascinating. Check out the Julian Jaynes Society for an introduction. Does he make any mention at all about the original Buddha, aka Siddhartha Gautama who, although there were no written texts in his time, still managed to achieve consciousness & also helped countless others who could neither read nor write, to achieve consciousness? I’ve found myself recently fascinated by neuroscience and the effects of meditation on the brain – reading all sorts of books about it. Is this book worth putting on the list or will it just make me cringe? Your take on it makes me think it’s the latter. Seriously? The voice of God??? No mention of Buddha (though I’ve still a third to go) but his definition of consciousness is pretty strict and somewhat peculiar to himself. That alone is worth reading the book for. @Ian- The strangest thing is that contentions along these lines are not terribly uncommon in Western Philosophy. It may seem obviously ludicrous, (and may actually be obviously ludicrous) but things are a little tendentious once one asks at what point, specifically, human beings became (and possibly become) self-aware. -Human beings have always been self aware (requires and infinite past, which is self contradictory). -Human beings are self aware from the beginning of their existence (contrary to observable evidence- babies don’t appear to be self-aware at birth, and there might be reason to propose that humanity became self-aware at some point in history). -Human beings become self aware at some point in their history (this could be either their shared history, as in humanity becoming self-aware, or else their personal history, as in an individual becoming self-aware). Of the three, it seems to me that only the last is possible, or possibly knowable at least. It does however give rise to two problems so far as I can see. At the outset one might consider who it was that was first self-conscious, and then how it is they came to be so, having not been so previously. Specifically, one is left to explain the mechanism of self-consciousness. -that concepts are language dependent (not on a particular language, but at least dependent on an abstract relation of identities). If there is anything to the posits above, then self awareness is in fact language dependent. It is a huge leap to get from there to print- especially because what will stand here as ‘language’ is for more rudimentary than anything one would normally envision when defining the term. 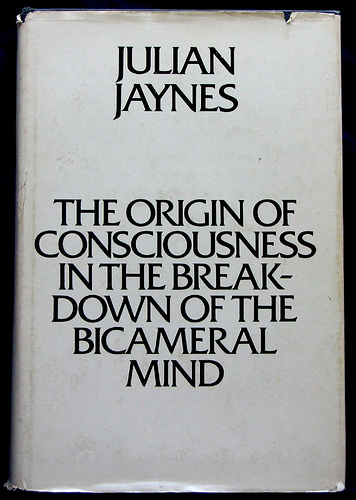 However, having not read the book (which I thoroughly intend to once I can track down copy) I wonder if Jaynes isn’t attempting to work out how self-consciousness becomes a shared experience. It is one thing to say that “this ‘ape’, at this point in time, at this place, by this process became self-aware” but is surely something entirely different from saying “humankind, at this point in time, at this place, by this process became self-aware.” The real difficulty, is that if you are going to say that human beings ‘became’ self-conscious, you can’t really get away with saying one without implicitly positing the other. You should head up a reading group. I’m in if you do, could lead to some interesting discussion. I think it’s the “only became aware well after the establishment of entire empires” that gets me. Much of what I find on this page indicates to me that the 20th century has rendered modern man mentally numb and unable to retain knowledge, or much less, recognize useful information when she sees it. One testament to the theory that our brains newfound ability (40,000 years ago?) to elocute basic metaphorical syllogisms spawned a chain of events that MUCH LATER led to higher forms of cognitive activity and ultimately the sacred state of ‘self-awareness’ is this curious human habit today of furiously exchanging useless information. Julian Jaynes’ book has made an impression on a lot of great minds of the modern era. Even if his facts are fudged somewhat, his speculations have inspired researchers to probe depths they may not have considered were it not for “The Origin of Consciousness in the Breakdown of The Bicameral Mind”. It’s a tough read, one that I may not ever finish, but after Richard Dawkins endorsement of it, I couldn’t resist.